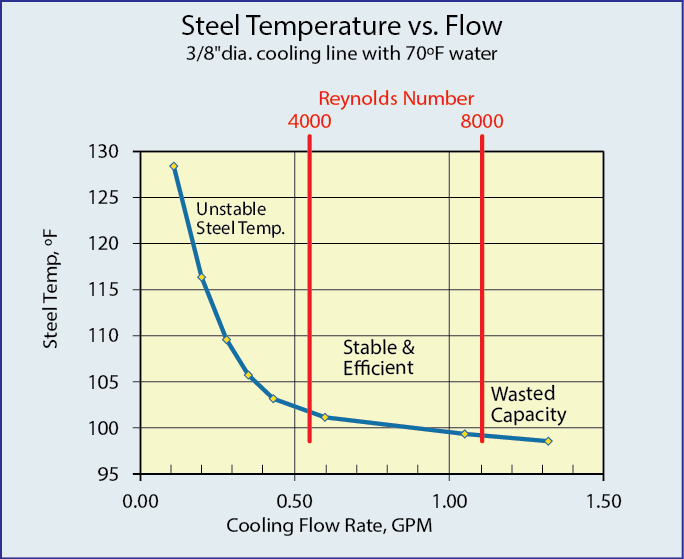 The Value Curve demonstrates the relationship between steel temperature and cooling water flow rate. Steel temperature decreases with increases in cooling water flow rate. Turbulent Flow is the point at which cooling efficiency is optimized. Flow rates higher than the point of Turbulent Flow provide diminishing improvement to cooling rate as seen in the Value Curve graph. Using FCI Technology available in Smartflow Tracer® Series Flowmeters, systemic cooling water flow can be optimized, conserving water and maximizing efficiency plantwide without plumbing changes. Reynolds Number is a dimensionless quantity used to predict fluid flow patterns. Reynolds Numbers over 4000 are generally accepted to be turbulent, providing optimum cooling efficiency. Our studies in Scientific Cooling* support stable and efficient mold cooling results using Reynolds Numbers between 4000 and 8000. Use our On-Line Turbulent Flow Calculator to help refine your process. *Scientific Cooling is a servicemark of Burger & Brown Engineering, Inc.